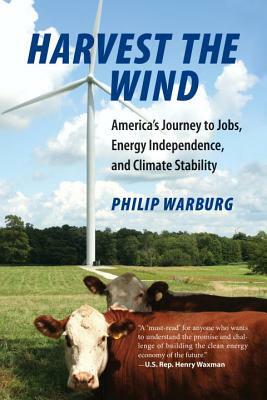 In Harvest the Wind, Philip Warburg brings readers face-to-face with the people behind the green economy–powered resurgence in Cloud County and communities like it across the United States. This corner of Kansas is the first stop on an odyssey that introduces readers to farmers, factory workers, biologists, and high-tech entrepreneurs—all players in a transformative industry that is taking hold across America and around the globe. Harvest the Wind is an earthly antidote to loftier treatises on global warming and green energy. By showing us how practical solutions are being implemented at the local level, Warburg offers an inspirational look at how we can all pursue a saner and more sustainable energy future—while at the same time investing in the nation’s infrastructure and jumpstarting its economy. Philip Warburg was president of the Conservation Law Foundation, New England’s leading environmental advocacy group, from 2003 to 2009. Earlier, he ran the Israel Union for Environmental Defense in Tel Aviv and was an attorney at the Environmental Law Institute in Washington, D.C. He has also worked with governments and citizen groups on anti-pollution initiatives in Egypt, Jordan, Palestine, and across Eastern Europe.